Helen Meek - Agile Coach at RippleRock - Coaching Dojos – At Scale! Coaching Dojos – At Scale! One of the key areas of my role I am super passionate about is people! They are the highlight and sometimes the lowlights of each of my days. But ultimately by loving, cherishing and harnessing their awesomeness, we can do great things in communities. I also think about my role sometimes as throwing a pebble into the community pond and the waves and ripples that come out carry on with them. Deep for a Monday I know! I wanted to share with you today one of my little pebbles that I kick started with my biggest and oldest client. For those that know me, you can work out who! Why I am passionate about Coaching Dojos? I see many role disciplines in my career revert to the old classic of, you tell me your problem and I will solve it for you. We know this is not the optimal way of getting people to think for themselves and ultimately people know the answers deep down, we just need to help them unlock it. So in the coaching dojos we give people the tools they need to unlock potential and ideas within themselves and each other. I have seen managers become less tell and more coach, which reduces burden and increase the ability for leadership and the coaching of others. I love that ‘A-ha’ moment when my students use it for the first time in 121 or retrospectives, and they come back beaming from the results. I have run these in many organisations, but often run also at the London Lean Kanban Days conference. What is a coaching Dojo? Each dojo has a time box e.g. 10 minutes and we ask people to bring real life situations they need help with. Work or personal is fine and we have strict confidentiality rules. We introduce different models and give people the opportunity to practice these. At the end of the time box we ask for feedback from the seeker, coach and observer (in that order). By doing this the coach gets the valuable opportunity of feedback and this can really shine a light on some of the bad habits we have or don’t even know we are doing. What types of habits do you see commonly? Not really listening. Maybe thinking about new questions or solving the problem while the seeker is speaking. The Coaching Dojo is about teaching you awareness of yourself, different models to use and a coaching mindset/stance. It is a great playground to practice safely in. So how did you scale this? 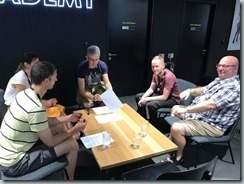 Originally with my client we opened coaching dojos up to 65 ScrumMasters, and for at least a year we ran monthly 1 hour sessions where we would introduce different models and practice. However we wanted to make this more of a rolling program and something a little more formal. We also didn’t want to limit it to just the ScrumMaster community, because developers, testers, product owners, you name them! Can get value from these skills. So we created a 2 month program and kicked if off with a taster session so people can drop in and see if it’s something they want to do. Each 2 month program is a commitment and so the expectation is that they will commit to 1 hour per week for the duration. Originally I had about 4 sessions a week and it was getting crazy, and so I sought the help from my good buddy Richard Arpino and Chris Toby to help organise. My long term goal was always to hand this over the organisation to continue without me. The real test of success! We also had lots of no shows which is very frustrating, but since we changed to a 2 month program we have found this to be so much better. People were always very compliant in sessions, rather than difficult as some can be. So when this happen the lead coaches step in with example. Keep the groups static as this builds trust in the peer group. You also find they start working closer with each other in the wider business. We run small groups of 4 people, this allows one person to miss a session. We keep them small so we can focus on individual growth, rather than sheep dipping. We have had so many learnings along the way, and this is really about experimenting and finding the right fit for the people. But something must be working as we have a waiting list now! So what is the curriculum? There is now a formalised curriculum and we created a knowledge bank where people can go and see useful information about the models and coaching in general. Plus an internal coaching Facebook page where we put daily words of wisdom and new ideas they can try. We have book recommendations and are encouraging people to practice as much as possible. The lead coaches can then support and debrief any difficult situations when they take these practices back to the teams. Each of these modules have supporting documentation and we may spend more or less on one than others, depending on experience in the group. We also have different stages of groups. The first 2 month program is level 1 and 2 and so developing. We want to launch a level 3 which looks deeper into the art of coaching people and more practice of course. We are thinking about doing these in larger groups as they have already mastered the basics. We need to work this out and so ideas are welcome. So we scaled by putting a program in place and by having three people that can run a max of three groups at any time. We could add more lead coaches, but we found scarcity made people invest in this more! I believe we have trained about 100 people from all different role types. For the last two months I have pretty much handed everything over to Richard and Chris. I just pop along when they need help or I have some free time. I leave them for pastures new in a week or so, but I know I have left in strong and capable hands. Plus I look forward to seeing how they can advance the program further. There is so much love for coaching dojos in this organisation and I see how it has made a difference in the communities here. I look forward to my next adventure, when I can try something similar/new like this again. So what are you waiting for? This is something you could set up and try with little investment. If you want some help or advice, please get in contact and I will support you however I can. I look forward to news of your experiment.